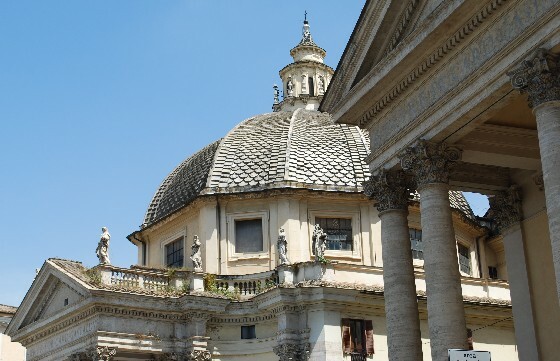 These “twin” churches dominate the southern edge of Piazza del Popolo. They are Santa Maria dei Miracoli, built in 1681 and Santa Maria in Montesanto, built in 1679. 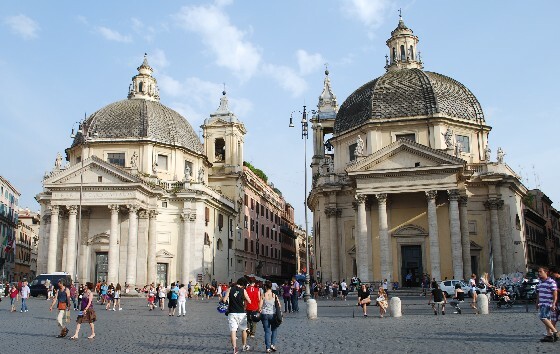 The two churches were begun by Carlo Rainaldi and completed by Bernini and Carlo Fontana and they define the junctions of the 3 main roads which lead from the piazza. Have a closer look at the churches and you’ll find that they are not actually identical, but there are little details that vary. In fact, one church is on a much bigger plot than the other. Piazza del Popolo is visited on the Best of Rome Walking Tour which consistently gets great reviews from travellers who’ve been on it. The churches are open Monday to Saturday from 6am to 1pm & from 5pm to 7pm and on Sundays from 8am to 1pm & from 5pm to 7pm. Admission is free but a dress code applies.